We are still going through a very busy season in our lives but my husband and I have been making a concerted effort to Take Time Out. This weekend we spent some time walking, We live just ten minutes from gorgeous fields and forest in one direction and about fifteen minutes from the Thames Path in the other. Here we are on the public footpath through the fields at Purley on Thames. It’s so refreshing to be able to get outdoors now the weather is nicer. It’s still fairly cold here though! I was very pleased to discover that the bluebells are blooming. The bluebells in my garden are a bit behind these and will probably bloom later in the week. 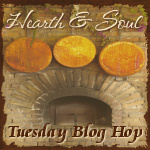 Yesterday was Palm Sunday in the Christian calendar and Passover begins this evening so today I am featuring Easter and Passover Recipes from last week’s hop. And now on with The Hearth and Soul Hop! Great photo’s of your walk about, I love to be outdoors. Wishing you and your family a very happy Easter Season and thanks so much for the party. I most likely won’t have a post this week, but I wanted to pop in and say hello! Thanks for featuring my Double Chocolate Raspberry Truffles! Have wonderful holiday! My pleasure, Jill, and thank you 🙂 Hope you have a wonderful holiday too! So lovely to see the beautiful spring pictures. Thank you so much for featuring my Passover Recipe Ideas this week and thanks for hosting. I look forward to this linky each week. I have been taking our dog for two walks a day in our fields because I so happy to not be tripping over snow and ice. I live in a town with a lot of expat Brits. They say our fields remind them of home. Happy Easter, April have a wonderful Spring. Your walks sound lovely and I bet the dogs really are enjoying being out in the sunshine too 🙂 Happy Easter – and Happy Spring – to you too, Diane! What lovely little spring flowers! This week I’m sharing a recipe for what I call Epstein-Barr Tea and a post on natural remedies for Epstein-Barr virus. Thanks for hosting and happy Easter! I love bluebells – they really are gorgeous. Your recipe sounds really interesting, Danielle. I don’t know much about Epstein-Barr virus so I look forward to reading your post. Happy Easter! The spring is so a wonderful time to take a “time out”. Looks like y’all are having a wonderful time. What a nice place to walk!! Thanks for hosting and I wish you and your family a Happy Easter. I’m so glad you are pleased, Winnie! Thank you for the Easter good wishes. I wish you and your family much happiness this Passover! What a great place to go for a walk, I’ll trade you for the suburbs of Phoenix. It really is lovely, Mireya! Thank you so much for being a part of Hearth and Soul. Have a wonderful weekend!